Trying to grab something that will be cherished by your loved ones forever? 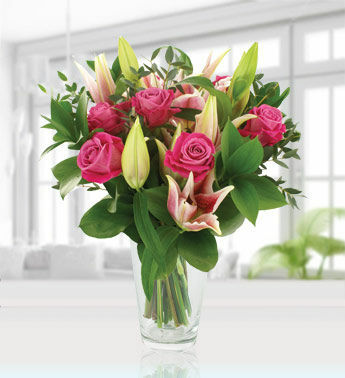 This spellbinding bunch of 12 pink roses and 4 asiatic lilies adorned with fresh green leaves in a glass vase is the perfect and memorable gift. Sent this to my mom to Mother's Day. She just loved it.